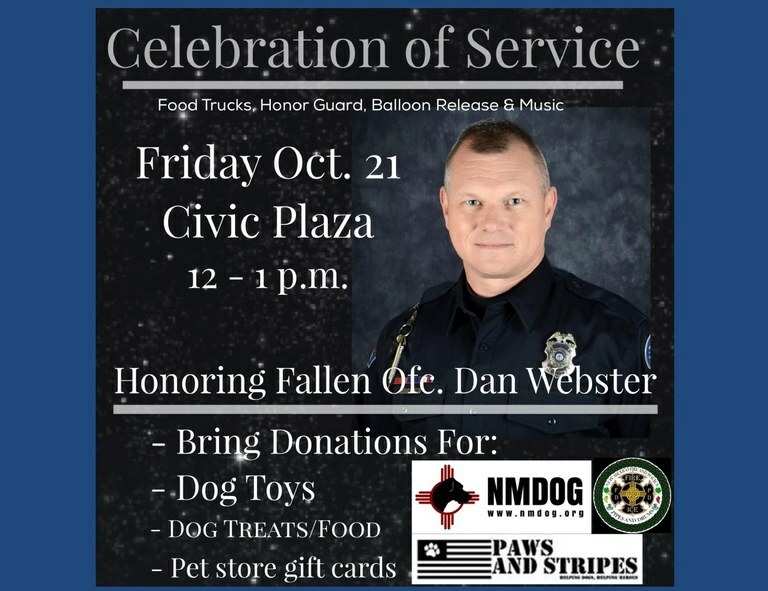 The community is invited to attend a celebration of service honoring fallen Albuquerque Police Officer Daniel Webster this Friday. WHAT: Picnic on the Plaza, Celebration and Remarks - Officer Webster’s wife, Michelle Carlino-Webster, Honor Guard, Balloon Release and music by New Mexico Pipes and Drums. WHO: Everyone is welcome to come and celebrate the life of our fallen officer. 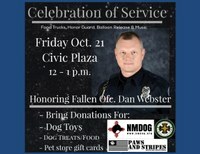 DONATIONS: Because he absolutely adored dogs, we will be collecting dog treats, toys, dog beds, gift cards to pet shops and other necessities to donate to Paws and Stripes and NMDog in an effort truly honor Officer Webster. Friday marks one year since Officer Webster was gunned down during a traffic stop near Central and Eubank. We hope everyone will come bring their lunch or get a bite to eat via the food trucks on the plaza, share memories of Officer Webster, and help us celebrate his service to our city.